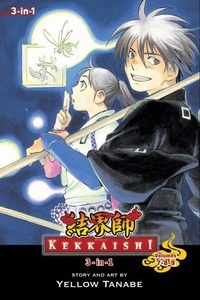 Contains volumes 7-9 of Kekkaishi! The Dark Watchtower, a mysterious group of pwerful ayakashi demons, is launching a consolidated assault against Yoshimori's ancestral land. Will Yoshimori, Tokine, and their lastest kekkaishi-in-arms, Gen, be able to fend off this all-out attack?